The Burnished-buff Tanager (Tangara cayana), also known as the Rufous-crowned Tanager, is a common South American species of bird in the Thraupidae family. It is found in the northern Guianas, most of Venezuela and east-central Colombia; also near the Amazon River outlet in Brazil, as well as most of the east of that country, Paraguay and northeast Argentina. It also occurs very locally in Bolivia and Peru. It can be seen in virtually any semi-open habitat with trees, including human-altered habitats such as gardens, plantations and parks. 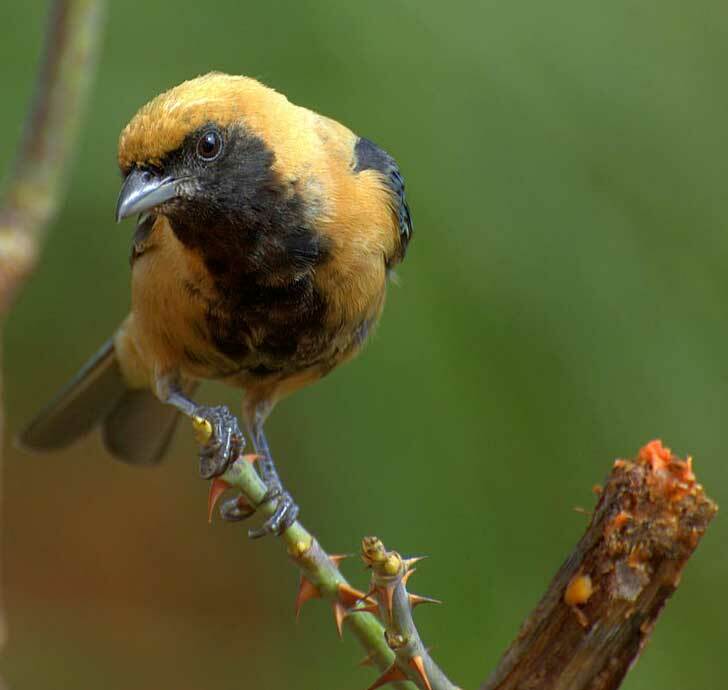 There are several subspecies of the Burnished-buff Tanager, them falling into two main groups: The northern and western cayana group, and the southern and eastern flava group (the subspecies huberi from Marajó Island is intermediate between the two main groups). Males of the cayana group have an orange-rufous crown, black mask, and cream underparts distinctly tinged blue on the throat and chest. Males of the flava group have an orange-buff crown, and buff underparts with a black patch extending from the mask, over the throat and central chest, to the mid-belly. Males of both groups have turquoise wings and tail. Females are duller than the males, and have black restricted to a poorly demarcated "shadow" of a mask. It is a generally common, and usually seen singly or in pairs. As all tanagers, it is a largely frugivorous species, being particularly fond of the fruits of the native Cecropia and Brazilian Pepper as well as that of introduced Magnoliaceae such as Michelia champaca. * BirdLife International 2004. Tangara cayana. 2006 IUCN Red List of Threatened Species. Downloaded on 27 July 2007.